For over two decades we relied on the well-regarded German manufacturer Papst to supply capstan motors for our belt drive turntables. Technically and musically we had good results with this motor in combination with our proprietary analogue speed controller. Helmut Brinkmann's extensive research and development on our direct drive motor for the »Oasis« and »Bardo« turntables gave him valuable insight into the control of magnetic fields and how to apply this knowledge to reduce cogging in a motor. It became apparent that the next logical step was to apply this knowledge in the design of a new motor for the belt drive turntables. 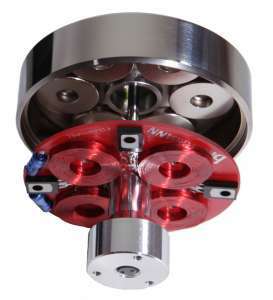 The new »Sinus« motor is better suited to driving a high mass platter (almost 46 lb) like the ones found in our »LaGrange« and »Balance« turntables, while the use of a 4-phase (4 times 90°) drive circuitry enables a very smooth rotation without cogging. The arrangement of the driving coils and the neodymium magnets in combination with the drive circuit achieves 16 “pulses” per revolution. Additionally a large rotating mass of 500 grams, achieved by using a nickel-plated steel motor body, works likes a flywheel. 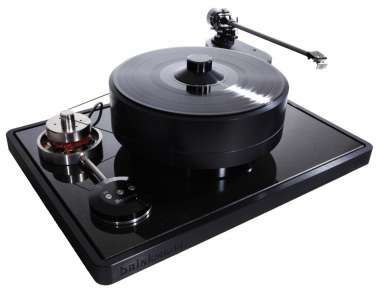 This drives the platter of the turntable with a very even force and reduces vibration. The new motor generates more torque and is therefore able to reduce the start-up time to a few seconds, no problem for the new vacuum tube power supply »RöNt II«, which is also able to handle the direct drive motors as well.